Donovan’s Great White Adventure – The surprises continue ! Hello again, Since the last blog entry concerning the White Shark dissection a lot has happened here in South Africa. In this blog entry, I’ll be talking about one day in particular. 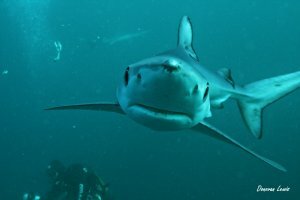 The day was May 14th me and the research assistant, Imke went on a trip with the Shark explorers to the deep blue just out of False Bay, we were going on this dive to see if we could find any Blue shark (Prionace glauca) and /or Shortfin Mako shark (Isurus oxyrinchus). We were told by Lalo that we needed to be at the dive centre at 6:30am, which made me feel slightly ill at the thought of getting up at that time but I knew it would be worth it, and how right I was. If we left from Gansbaaii we would have to get up at 2:30am due to the time it would take us to travel to False Bay. So we decided it would be best to head down to Cape Town the night before and stay at Imke’s house in Cape Town. This worked out well as we “only” had to get up at 4:45am!! We were at the centre for 6:20am, kit was sorted and paperwork signed, we were going into the blue. We loaded the boat and set straight out, on our way out of the harbour we had countless Cape Fur Seals (Arctocephalus pusillus) soaking up the early morning sun. We had seen on the Shark explorers Instagram page that the day before they had seen dolphins chasing a bait ball (Large school of bait fish) and were hoping we may also see some interesting things on the way out. The boat on this day must have been hit with the lucky stick on the way out as the ocean truly put on a show for us. We left the harbour and around 5 minutes into the journey the water erupted with the excitable jumping, spinning and movement of around 2000 Common Dolphins (Delphinus delphis) we were with these guys for probably around 10-15 mins they were riding the bow wave moving around and under the boat and got so close we could hear their whistling under the water. We were so busy focusing on the ones close to us that we didn’t even notice the commotion of a bait ball over in the distance which is where most of the dolphins were, flying above them were Cape Gannet (Morus capensis) that were diving for the fish. After we moved a considerable distance the Dolphins moved away to continue feeding on the bait ball and we continued moving further out to sea. It wasn’t long until we were blessed again when we saw the spout of a Whale nearby, it was so quick I almost missed it, it wasn’t until Imke noticed it again right next to the boat that we saw the back and dorsal fin of a Brydes Whale (Balaenoptera brydei) from what the guides were saying, they’re very shy and don’t like boat engines and we probably just caught that one off guard. Further out to sea we went and already we had been given a real show so we were anxious to see what the ocean had in store for us. 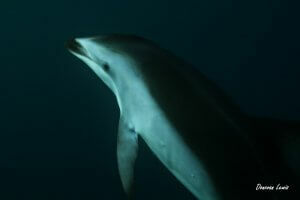 Once more we were treated to a spectacle, we reached the open sea we heard the word “DOLPHINS” shouted across the boat. 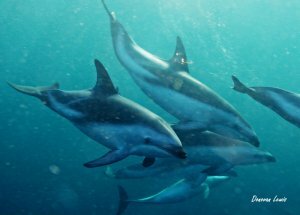 Now okay we’d already seen Dolphins but these were one of my favourite species, Dusky Dolphins (Lagenorhynchus obscurus). When they said the name, it went over my head what they were until I saw them and realised it was so exciting to see around 2000 of them all jumping, flipping and spinning beside the boat just as the Common Dolphins had done earlier. Then after around 5 or so minutes of them following the boat, the boat came to a halt and one of the photographers, who was from National Geographic, jumped over the side with the Dolphins. I watched two more follow and I asked if we could get in, we were already in our wetsuits and ready to and the skipper Brock said “Yeah sure”. In what felt like a second I jumped in the water and once the bubbles cleared I was confronted with a wall of Dolphins and couldn’t hear anything except the calls and chatter of 200 Dolphins zooming around me, it was and otherworldly experience and this was something truly special. They were so playful and inquisitive they came in to investigate what we were and what we were doing, they would come close and as we went closer they would dart away. They came so close we could have touched them, amongst the chaos of Dolphin madness that was all around us, there was another animal zooming around I managed to get it on film as well. I turned with the camera rolling and a strange object appeared in the gloom it came in so fast it took me a while to recognise it, it was a large Cape Fur Seal that came straight at me and at the last second took a left turn straight around me. We spent a good 20-25 minutes in the water with these beautiful animals before Brock and Nina said that it was time up and if we spend too much time with the dolphins we won’t get much time with the sharks. Now came the point in the trip that determined how long the trip would take, the job of the crew before they chum for sharks is to find the “blue water” the blue water is a warm current called the Agulhas Current, this current bring in warm water from the Indian ocean and this is where the sharks like to hang around. Now the current changes daily in its position and its strength. Mary from the White Shark Diving Company said that when she did the dive they had to go 30km off shore where they couldn’t see land to find the warm current but in our case, that didn’t happen, we found the current in 10 minutes and could still see land. We began chumming in the warm current and chilled out in the sun, who knows how long it could take for the sharks to show up that’s all a part of nature and working with wild animals. 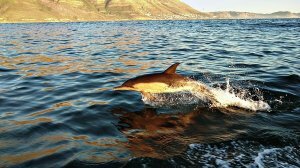 We drifted over 600m from the warm blue water and went into slightly cooler green water which wasn’t an issue as we could still get sharks, as we waited we had a multitude of Seabirds, Cape Fur Seals and Dusky Dolphins swimming around the boat. I asked if the myth that sharks and dolphins being enemies was incorrect and as Nina started to answer a blue shark showed up. We were told that we would have to wait for about two sharks to turn up before we got in the water as there is no point getting in for just one shark. Suddenly a second blue shark showed up and the briefing was started, we were told that they had never before done a blue shark dive with dolphins, so this would be a first for them but they did say that the dolphins might make the dive hard as they may scare the sharks away. As the Briefing was taking place we then heard the words MAKO which meant that a Mako shark was hanging around. These are one of my favourite species as they are the fastest shark that we know of, they are related to the White Shark and look as if they have been made of metal. Unfortunately, the Mako was eventually scared away before we got in but that didn’t ruin the dive that we had. After the briefing we kitted and got in, by the time we got in there were 4 sharks hanging around the bait and immediately I found my spot in the water column at around 7 metres and simply hovered mid water waiting for the sharks to come to me, after a minute or so once id relaxed and stopped being an excitable diver the sharks came over. Never in my life have I experienced something quite so magical and amazing as these sharks, they may not be the largest or most famous but they are one of the most adorable and most graceful creatures I have ever had the pleasure of sharing the water with. They Would come over to investigate what I was and what I was doing and were curious as to what my Go-Pro was on the top of my camera lens and would continue to bump it with their nose, whether that be due to the flashing light or electronics. During the dive we ended up having around 7 sharks all coming in to each one of us, the circuit for these sharks was simple; check out the bait bucket and Martin who was chumming, then they would go in a circuit to each diver and get close enough to them that they would bump their camera or bump them, then they would do the whole circuit again. We were told in the briefing that this is an interactive dive meaning when the sharks get too close we have to physically push them away in order to stop the sharks from becoming too confident, this essentially means we assert ourselves as another predator and the sharks will back off. During the dive, we also had the 4 Dolphins that were playing (annoying) the sharks. I think the dolphins found it funny to pester and annoy these sharks and the sharks were just trying to have a good time with the chum bucket. We also had 2 Cape Fur Seals hanging around as well and they too were playing with the sharks but the sharks weren’t too bothered with the seals. What strikes me about this experience is about what people say about sharks, people say they are these horrific man-eaters and that if you got in the water with them you wouldn’t get out. But that’s not what I felt with this dive, I mean sure love them and aren’t scared of them but I do have a healthy respect for them but not once did I feel in danger or on edge with these animals. In fact it was completely the opposite I was relaxed and happy to be in the water and even when a shark bumped me or bumped my camera never once did I feel in danger. Once we were on our way back to land I felt changed in the way that it felt good to dive with an animal older than time itself and to realise that nature has created some of the most spectacular of beings and it’s about time mankind took note and realised that we should be protecting these beautiful creatures. Thank for reading this lengthy blog post I hope you enjoyed reading and I hope that you will read the next one coming soon.